12″ x 12″ x 1.75″, oil on deep edged canvas, ready to hang. One of my favourite things about this time of year as we move through autumn, is the change in the sky, particularly in the evening. I mentioned before that my studio is at the top of an old 18th century house with 74 steps to climb. Phew! It’s a real artist’s garret with a bonus: a clear view of the sky across roman, terracotta tiled rooftops and glorious sunsets. I don’t sit down and paint them and rarely take photos but I come away and let their memory percolate, trusting they will emerge at some stage. What surfaced today was fully formed. It’s a view looking across the blanket bog of the Wicklow mountains when blue hour starts. Isn’t it fascinating that recalling emotions felt when looking at clouds is not always a linear process. It tends to include different imagery. Love the luscious richness and depth of the color of Autumn. Well done, John!! Wonderful colours! 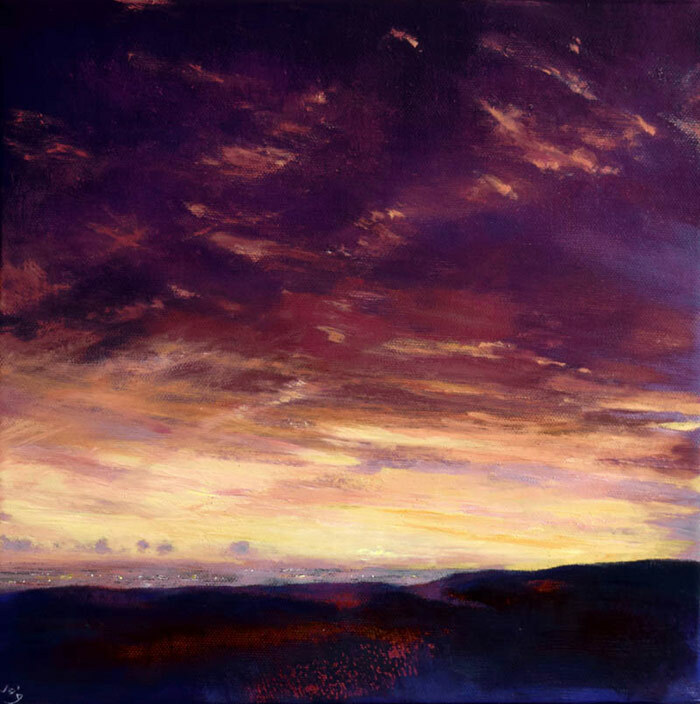 I enjoy painting watercolour skyscapes, and particularly like the combinations of raw sienna, indigo and alizarin crimson – which I think I can see in your picture. Thank you Robert, yes certainly some of those colours, apart from Alizarin Crimson, instead I use Scarlet Lake and also Cad Yellow. Gbest of luck with your own work. In retrospect I realized how varied the color themes of your works have been. I’m so impressed also with the many varied balances of compositions and color harmonies; they being proportion, intensity, and contrast; so I’ve been taught and have experienced. Thank you for your kind words and encouragement on the paintings. I will keep at it and I hope you do too. Hello John, I think your other contributors are right, it is all about the colour; the richness and intensity which is present in nature. And yet, it is about the special feeling it conveys at the end of a day. This evening I saw a stunning sky with delicate dapples of pinks, creams and violets and I said, ‘it looks like one of John’s evening skies’ – finding this waiting for me was a lovely surprise. Thank You! Thank you for your poetic reading of the painting. Your work is beautiful John, when I see a powerful sky painting I like to turn it sideways and upside down..different perspectives … It’s like looking at the surface of the earth from outer space.. Thank you very much for your comment. How interesting, I tried turning it upside down and you are spot on Irene, it does look like the surface of the earth from outer space.